It’s been roughly four years since Shovel Knight graced the world and I still hold it up as the gold standard for how a retro homage should be. It borrowed from games of the past but added its own style, which made it feel like it belonged among those games rather than a simple emulation of that era. 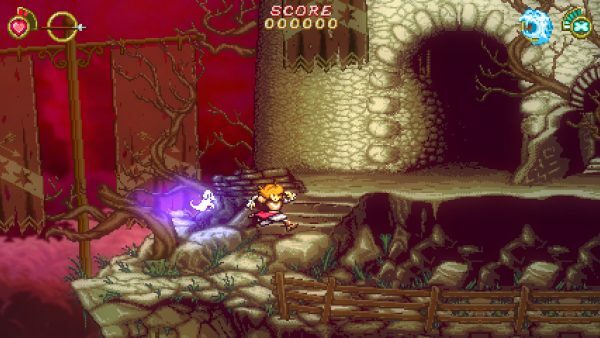 Battle Princess Madelyn serves as a direct counterpoint to a game like Shovel Knight: it’s a game that photocopies the styles of the late 80’s and early 90’s but does nothing innovative with it. Battle Princess Madelyn is so blatant in where its taking inspiration from that not drawing comparisons would be ludicrous. It starts with the opening of The Princess Bride, “updated” for kids today (read: Madelyn has a tablet). Yet this scene lacks the fun and charm of the Princess Bride original, feeling like a retread merely for the sake of it. Madelyn herself is a “cute kid” template who is supposed to be charming but ultimately falls short. She spouts tired jokes, has an adorable doggy with her, and just loves her grandpa. She’s wearing the guise of a relatable character but she comes across as boring and perfect, a Maddie Sue if you will. What it’s trying to emulate had a sense of fun or goofy charm that came naturally. Yet with Madelyn it’s not there because all we have are the superficial elements with none of the fun underneath. The rest of the story after the intro is generic fantasy that again tries to be cute but comes across as forced. Oh, the skeletons call her kiddo but skeletons aren’t that nice usually, how funny. Like Madelyn herself it’s cliche after cliche without a hint of introspection. No ideas are played with, just references that make you say “Hey, I too remember that thing.” Shovel Knight also did things in a straight-faced manner, but because the premise itself was so silly, it gave the game that charm that older games oozed. However Battle Princess Madelyn is content to regurgitate its own nostalgia with no thought to why this style worked so well. Super Ghouls ‘n Ghosts is a great game if you’re into that sort of thing, and that’s where Battle Princess Madelyn gets its gameplay design. I personally have no real nostalgia for Super Ghouls ‘n Ghosts, not really experiencing it till I was in my twenties. At the risk of sounding like a curmudgeon, I don’t care for it. The game is littered with enemies that love taking cheap shots at the frail protagonist, all placed in locations designed to annoy. On top of that, it’s a rather unforgiving game that a little too tough-as-nails for my liking, but that’s just one woman’s opinion. If all that is your jam then you’ll love Battle Princess Madelyn enough to ignore the generic narrative because that’s all it is. Nothing added outside of making starting over a tad less painful. Is this a bad thing? Not really, just more of showing off what the game is good at: simple mimicry with no additional thought put into it. Battle Princess Madelyn fails to live up to its predecessors because it seems to have judged them by their covers alone and missed out on what made them special. Everything feels forced in order to invoke a feeling that’s not there. The gameplay is content to add little to an almost 28-year-old game and, while some may find that appealing, it keeps this game from having its own identity. The movies and games it tries to emulate had personality and enough substance to give them some staying power. Madelyn fails to find its own identity, instead just trying different masks as quickly as possible.